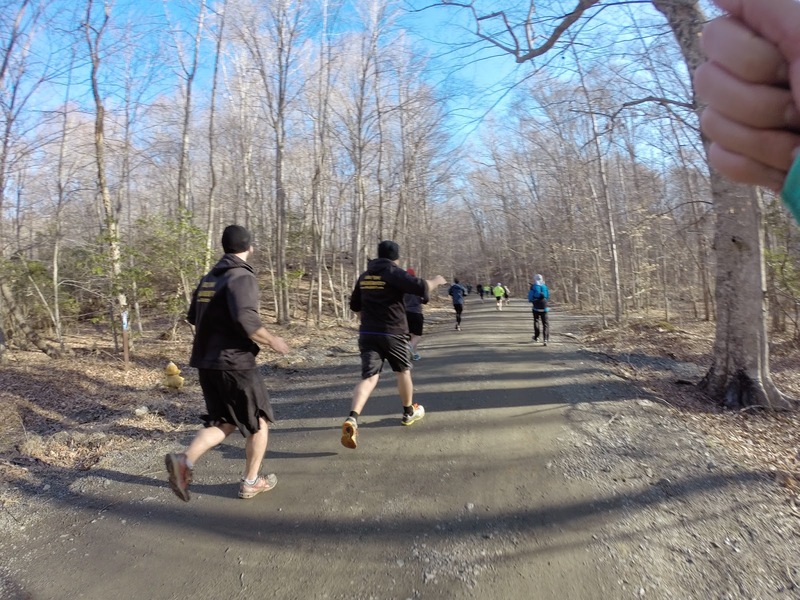 The coveted Marine Corps 17.75K Access Granted event was held this past Saturday. 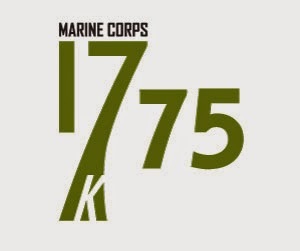 Crossing the 17.75K finish line guarantees runners access to the 40th Marine Corps Marathon (MCM) in October. MCM recently went to a lottery entry system because the race got so big. 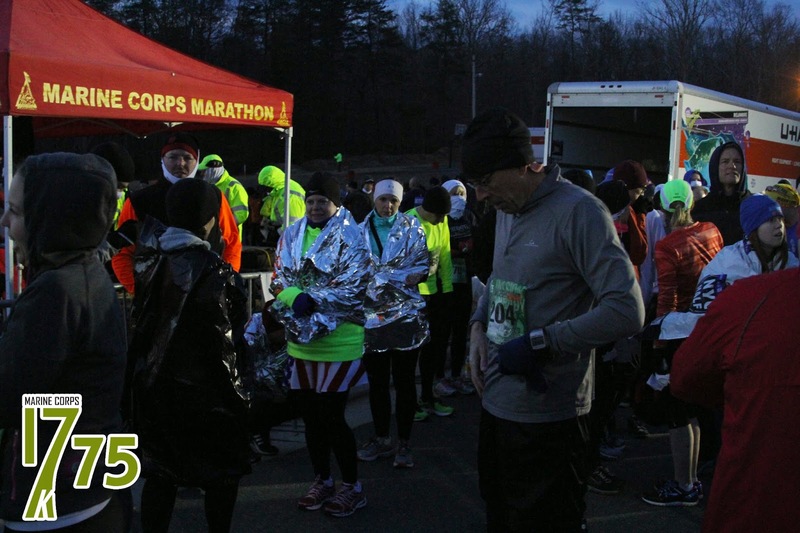 As you can probably imagine, the Marine Corps 17.75K sold out quickly– less than 7 minutes to be exact. But Nick and I made it in! The day before the race we drove to the VA Runner Store in Dumfries, VA to pick up out race packets. 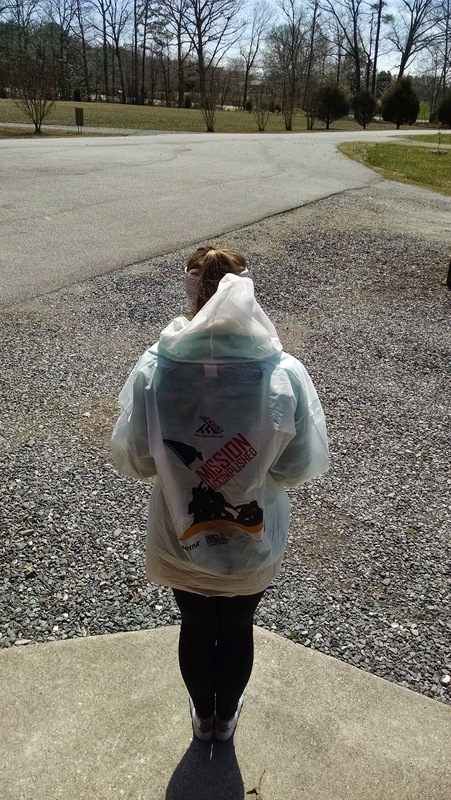 We unhappily found out Saturday morning that we could have picked up our packets race morning. Other than that annoying aspect, the race logistics were great. There was no parking directly at the starting area but the event had designated parking a little over a mile down the road and buses drove runners to the start. It was really cold race morning. Like 22 degrees cold when we left the house at 4am. We knew we would quickly warm up once we started running but we had almost an hour of standing around waiting for this to start. 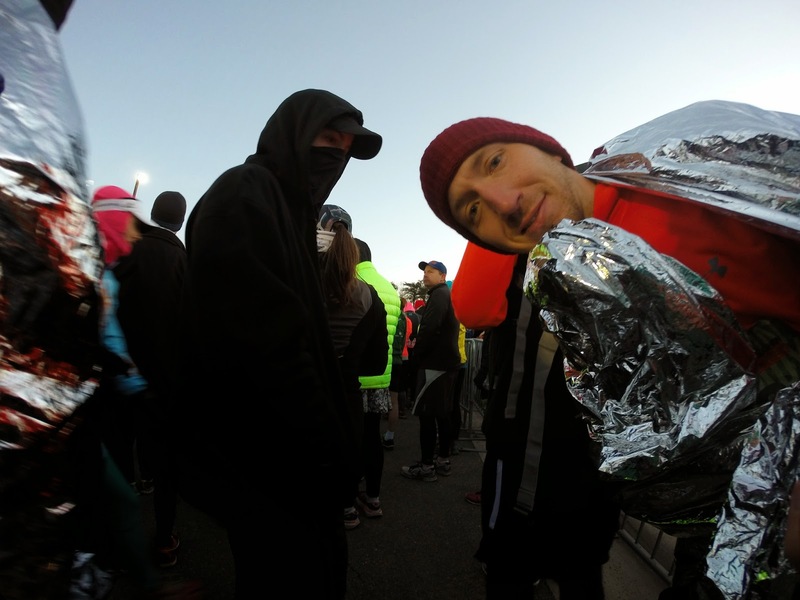 Nick and I both had old race space blankets wrapped around us for warmth but it wasn’t enough. I was slightly miserable because of the cold until I finally started running. That’s me in the space blanket! Right before 7am the runners were called to line up. Nick was trying to place in his age group so he left to go up to the front. I chatted with the woman next to me once he left. The National Anthem was sung and a flag ceremony was performed. Then the runners were off! My plan going into this race was to only take walk breaks at the aid stations which were spaced approximately 2 miles apart. I also went unaided and didn’t carry my own water. The course was lollipop shaped. With the first 4-ish miles being mostly on the gravel/dirt road, the next 5-ish miles being paved road, and the final 2-ish miles being gravel/dirt and turning back into paved road on the final stretch. There was not a wave start or designated lineup based on pace so the first 0.5 mile or so I was dodging a lot of people. Thankfully, this first part of the course was on the main road so it was pretty easy to get around people. 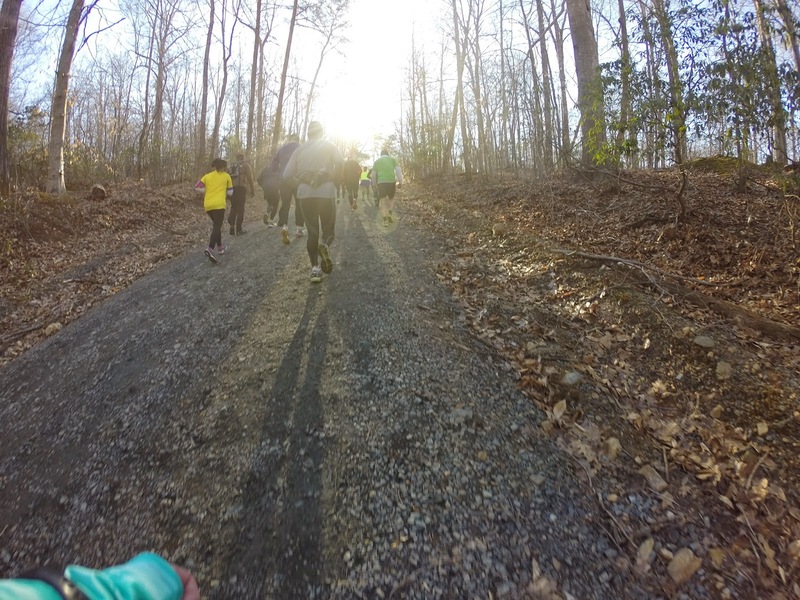 Not long into the race we turned into Prince William Forest Park and the road turned to a gravel/dirt trail. I knew the course was considered hilly, but I didn’t expect it to be as hilly as it was. 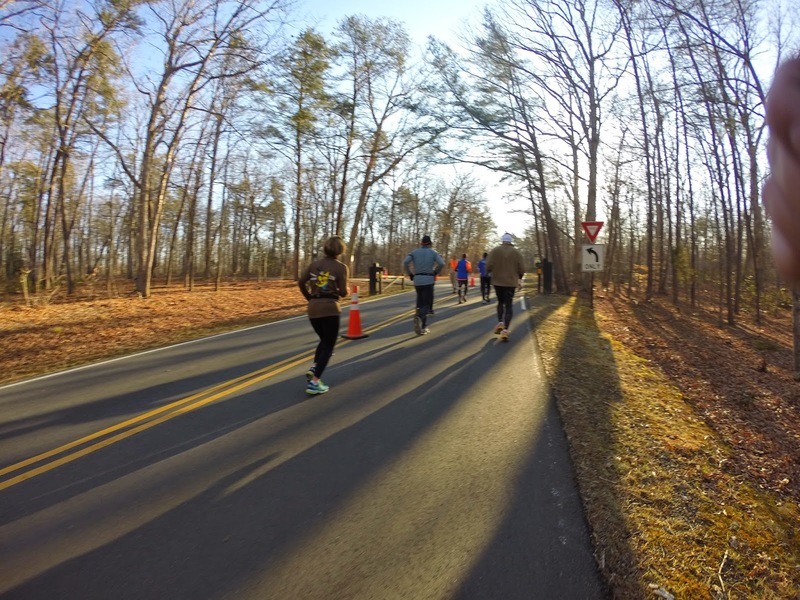 Right after entering Prince William Forest Park the “rolling hills” began. 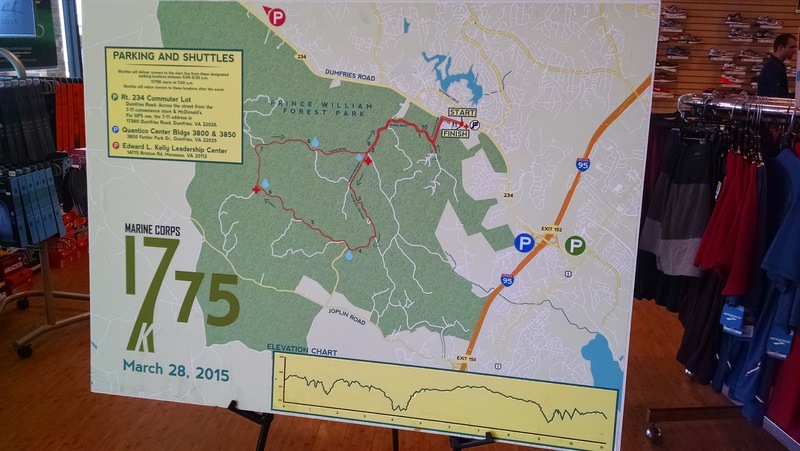 I guess this race considers rolling hills to gain and lose 100-150 ft of elevation on each one. 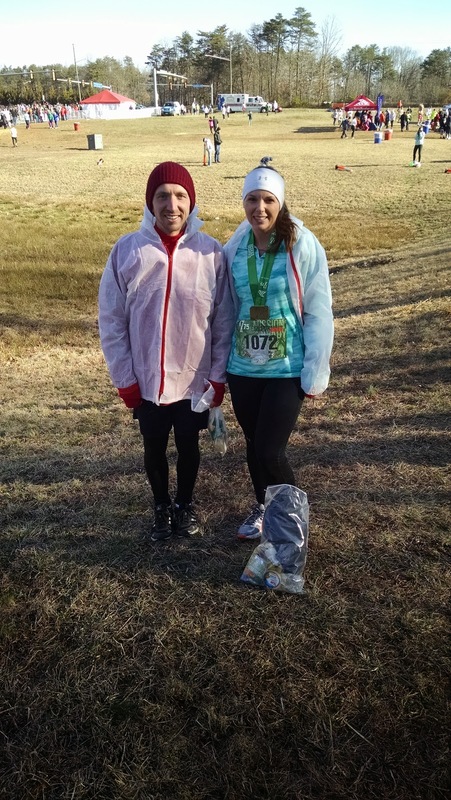 Nick and I have been doing a lot of hill training to prep for the Blue Ridge Half Marathon in April so I wasn’t worried about the hills, just slightly caught off guard. 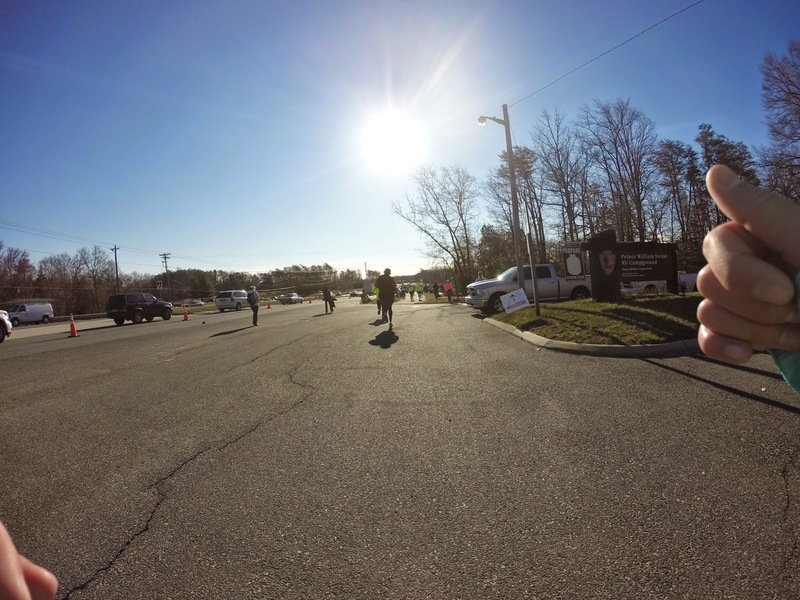 I felt so strong during the first 4 miles of the course. 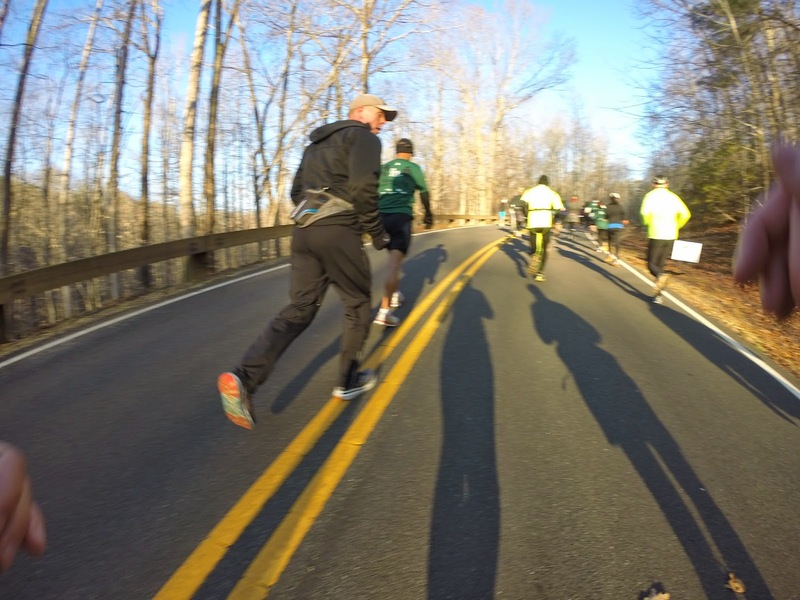 I was passing people on the downhills and passing people on the uphills. I love trail running and the terrain felt great on my legs. Somewhere around mile 4 the course came out of the forest onto a main paved road through the park. There was a long and glorious downhill not too far into the paved portion of the course. My form was holding up and I was able to lean into the hill and just fly. What an awesome feeling. From studying the map I knew “the hill” was between mile 4 and 5. Everyone was talking about it, but I thought “What’s the big deal? It can’t be that bad.” Eventually I saw “the hill” in the distance. Yikes. It didn’t necessarily gain a lot of elevation– I think roughly 150 ft..maybe a little more. But it was steep. I gave myself a quick pep talk and went for it. 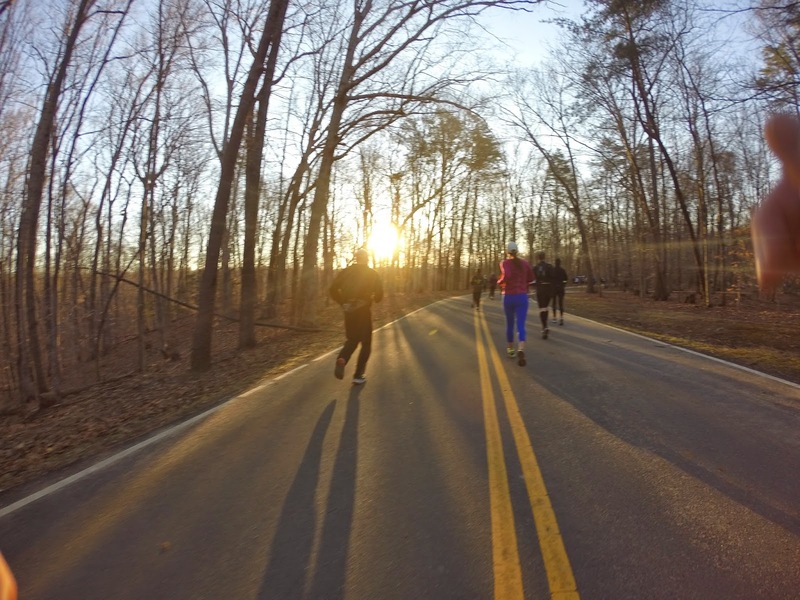 I slowed my pace, focused my eyes a few feet ahead of me, and steadied my breathing. I kept moving and actually passed some people as I ran up the hill. In my head I was repeating “You’re killing it. Keep going.” I was so proud of myself on that hill. When I reached the top a lot of people around me had slowed to a walk. But not me. 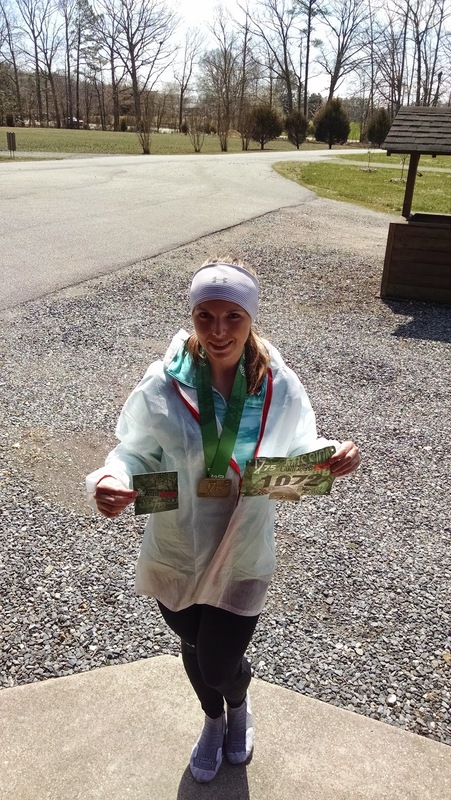 I kept running, eventually I got my heart rate back down, and began to pick my pace back up. The next several miles of the race were pretty uneventful. The course was relatively flat. My legs started feeling a bit heavy. I felt like I slowed down. Looking at my splits post race I really didn’t. Between mile 7 and 8 I saw my friend Jackie pass me. She was knocking it out of the park. I wanted to yell to her but didn’t want to ruin her focus. Around mile 9 the course departed from the paved road and headed back on the trail towards the finish line. This part of the course was a repeat of the first 2 miles. Not far into the trail was another huge hill. I had forgot how awesome of a downhill we had on the outbound leg. This hill was tricky– you go up a bit, then it suddenly turns and gets really steep the rest of the way. At this point I caved to the voice inside my head that said to walk. Slightly disappointed with myself. A lot of others were walking the hill and I think this made me feel like it was ok for me to walk as well. I ended up walking the entire thing. This was my last walk break in the race. The rest of the course was pretty flat. I had slowed down at this point for sure. And was happy to finally pop out of the woods onto the final stretch of road. After crossing the finish line a Marine put a finishers medal around my neck and a nice volunteer handed me the official Access Granted card! I finished in 1:49:22 with an average pace of 9:55 min/mi and Nick placed 3rd in his age group (9th overall) with 1:12:18. Overall this was a great event. Very well organized. A lot of awesome volunteers. 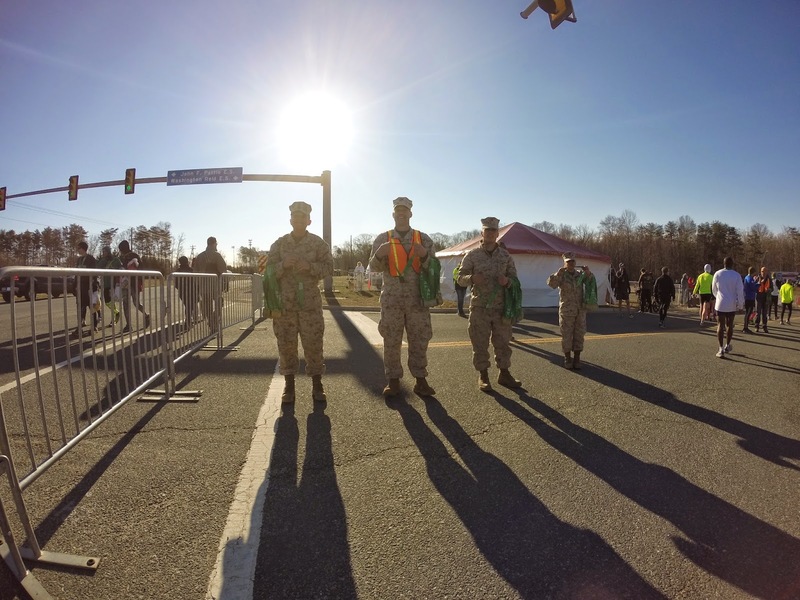 And the perfect way to guarantee access into the Marine Corps Marathon. I would highly recommend this event to other runners.